RITMSCENAR™ Professional devices are designed for health practitioners, such as MDs, Physiotherapists, Veterinarians, Nurses, Chiropractors, Osteopaths, Rehabilitation Practitioners, Podiatrists, Massage and Sports Therapists etc. SCENAR technology has been proven to provide quick and sustainable pain relief, as well as improved functions and quicker rehabilitation, in a wide range of painful conditions. RITMSCENAR™ Professional devices are micro-computers with built-in electrodes that deliver complex non-invasive, interactive electrical stimulation directly to the skin (transcutaneously). 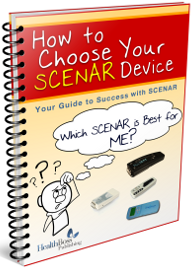 The SCENAR™ impulse waveforms and frequencies change automatically to prevent the body from adapting to the stimulation. The RITMSCENAR™ Professional series devices measure the body response to the electrical signals and display the information on a LCD screen. This allows a practitioner to view current readings and choose the most appropriate mode of operation and zone of treatment. RITMSCENAR Pro Plus is the most popular version of SCENAR among professional users, which constitutes the best compromise between price and quality. 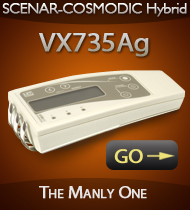 It is a multifunctional and powerful SCENAR device designed for advanced users. 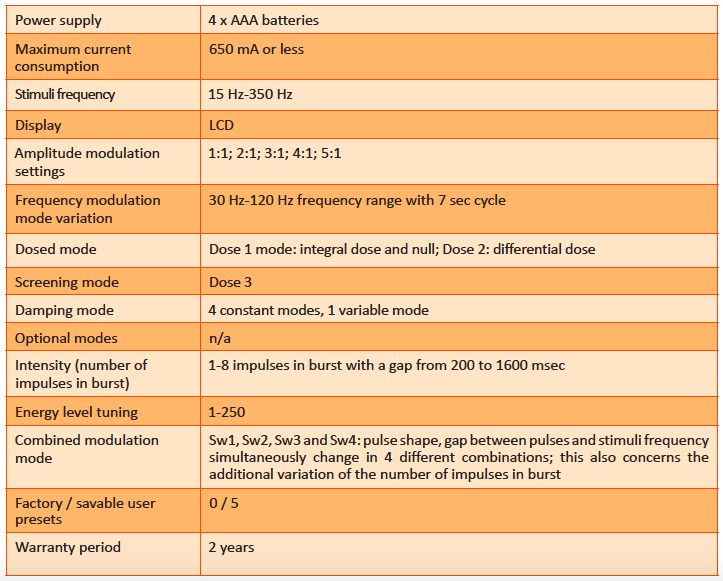 As compared with the previous version (RITMSCENAR Pro), this device functionality is extended to include the second mode of dosed stimulation (Dose 2 – a differential dose), a screening mode (Dose 3) and four (4) modes of combined modulation (swing) that allows changing parameters of stimulation pulses simultaneously and use their different combinations. The device is very popular among physical therapists. RITMSCENAR Pro Plus is a multifunctional and advanced professional RITMSCENAR model. At the same time, it is a light-weight, portable, and easy to use SCENAR device. Manual Mode – all device settings, location of active points, and treatment duration are determined subjectively by a therapist. 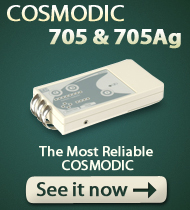 Dosing Modes: Dose 1 and Dose 2 – treatment of a particular skin area is dosed automatically by the device. 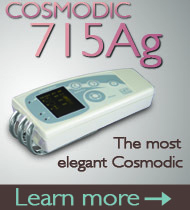 The treatment time is determined by the device and depends on the changes in skin parameters. Screening Mode – a measuring mode for quick assessment of the most optimal treatment zones. The device can be set up with various Amplitude Modulations (AM) depending on the stage of the pain process, treatment area and the individual response of the body. The Amplitude Modulations integrated into the RITMSCENAR Pro+ are: 1:1:, 1:2, 1:3, 1:4 and 1:5. 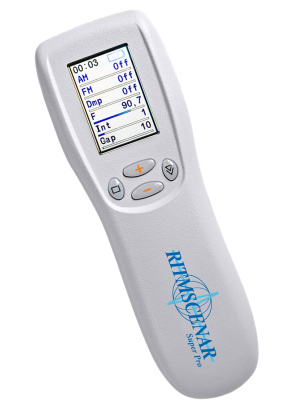 Five Damping modes (Dmpf) are available in the RITMSCENAR Pro+ to be used according to the complaint phase, skin sensitivity, and body response. 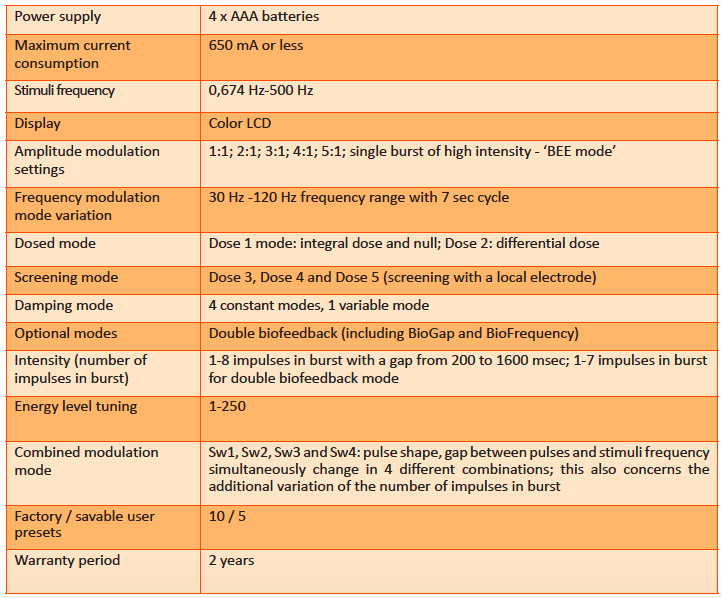 Frequency Modulation (FM) is from 30Hz to 120Hz. As an addition to the FM modes, the RITMSCENAR Pro+ also supports four Swing modes in order to prevent the body’s accommodation to the signal. 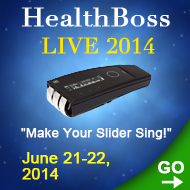 Frequencies can range from 15Hz to 350Hz and can be used during different phases of the disease. Practitioner can also control and modify other parameters of the device, such as: impulse intensity, duration of gaps between impulses, and power influence for achieving optimal treatment results. With the RITMSCENAR Pro +, health professionals can easily manage pain, improve functions, and speed up the rehabilitation processes in a wide variety of health conditions. RITMSCENAR Super Pro is the current upgrade to the most versatile professional device developed so far in transition to the new generation of SCENAR devices. It includes all the most important functions for professional use. 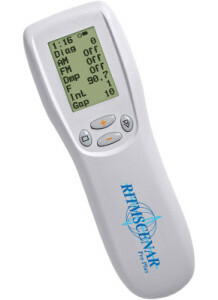 As compared with the previous version of the device (RITMSCENAR Pro Plus), the device functionality is extended to include the third mode of assessment screening (Dose 5) – screening with a remote local electrode. The most important ‘know-how’ of the device is the double biofeedback that allows to determine necessary stimulation parameters in acute states in the automatic mode. The device includes factory pre-settings (Presets) for cosmetology, for acute conditions, for stimulation before and after athletic training, and also for recovery after traumas (more presets are being developed). Thanks to them, even a user without any SCENAR therapy experience can obtain good results after the first sessions. The device has a color display and new accessible interface. The updated menu with fast navigation functions allows to considerably reduce the time required to make the device ready for operation. 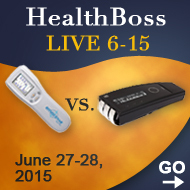 It is supplied complete with a remote local electrode (to be used for screening in Dose 5 mode). 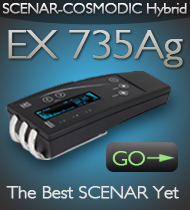 RITMSCENAR Super Pro is the latest model of the RITMSCENAR professional devices that incorporated all latest achievements in the evolution of the first generation SCENARs. In this video Yuri Starovoytov, the General Director of OKB RITM ZAO, the manufacturer of RITMSCENARs, introduces you to this rather remarkable device. RITMSCENAR Super Pro is highly recommended for any health professional, who would like to incorporate the SCENAR technology into his/her practice, as the device with a great therapeutic potential. 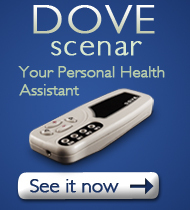 At the same time, the device can be successfully used at home in a variety of situation, due to the Presets that greatly simplify therapy and shorten the learning curve. If you would like to optimize your experience with the Professional RITMSCENAR device and let it do for you all it is capable of, you need TRAINING. We highly recommend ONLINE Training Courses for Professional RITMSCENAR users created by RITMSCENAR Australia. Their virtual training provides you with an easy and efficient learning experience.